PC Parts and Accessories: D Link DNS 320: Installing fun_plug and Transmission. Trial and error for Linux newbie. 19th March 2016: There were some broken links for the pictures. I have updated it. I have a D-Link DNS 320 ShareCenter Network Access Storage (NAS) for quite some time. It is a basic NAS which I used to store photos, documents and most importantly, movies. From the NAS, I stream it via LAN to my AC Ryan outside in the living room. The functionality of DNS 320 is nothing compared to Synology or Asustor but it is serving me well so far. One of the things that I like about it is the in-built torrent download. I put in the torrent URL, click on Add Torrent button and the download will be start straight into the NAS, without going through the PC. I can leave the NAS overnight and it will download anything. This article that I am writing is more for a reference for what I have done with my NAS, so that I do not have to refer to multiple sites if anything goes wrong. If you plan to install ffp, I suggest that you read all the resources I mentioned earlier and read my article until the end. I do not suggest that mine is definitive and it comes with its own caveat. It has worked with my DNS 320. I do not know if it works for other NAS. 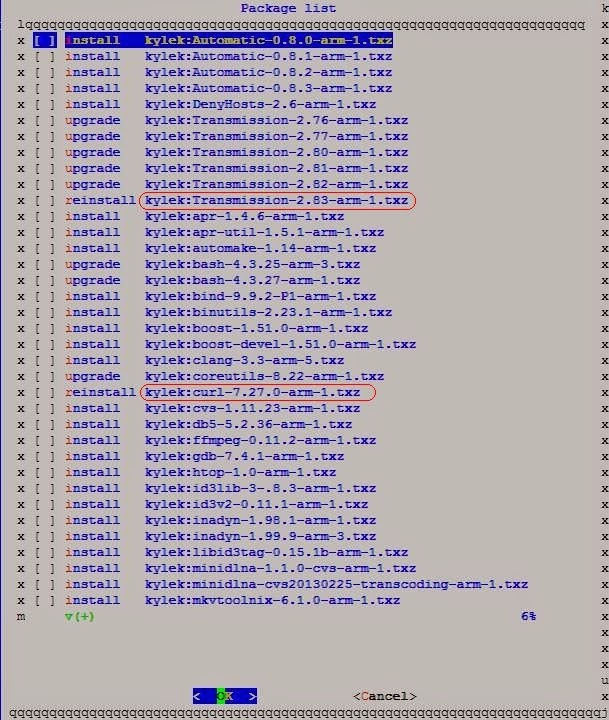 In summary, I am going to install fun_plug. Make sure that it is correctly installed and running. Next I am going to install transmission. Ensure that these two files are named fun_plug (not fun_plug.sh) and fun_plug.tgz (not fun_plug.gz or fun_plug.tar.gz or fun_plug.tar). On the DNS 320, place it on the top directory of Volume_1. Place this 2 files in Volume_1 of your NAS. After the reboot, go back to Volume_1. There will be a couple of new files added to your Volume_1. That means fun_plug was successfully installed. 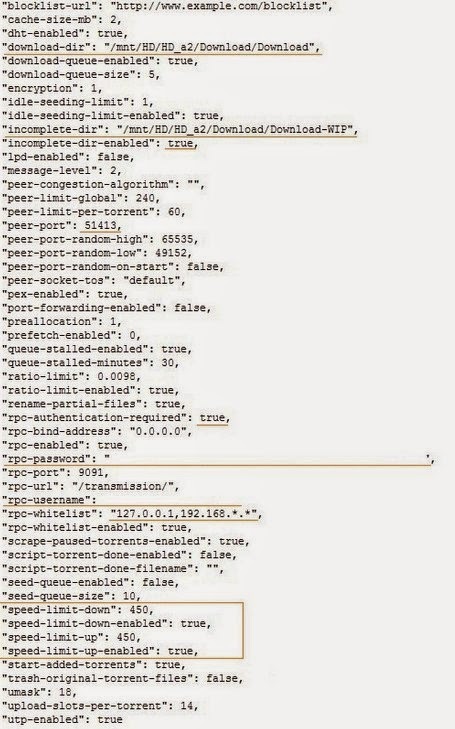 With the reboot done and the additional fun_plug files install, we would need to connect to the DNS-320 using a protocol called Telnet with a telnet client called PuTTY. - the host name (or IP address) of the DNS-320. In my case, I use the IP address. Response when telnet into NAS. This prompt tells me that I am logged in. The root password has to be changed. This means we are able to login with the password. Next step is to store the password and configuration in the memory, otherwise the new password is lost everytime we boot the DNS 320.
screenshot above. Its ok,as long as the password is saved. According to nas-tweaks.net, telnet has major security limitations. So we would be using secure shell. Continuing from our existing session from where we left off earlier on. Login using the password we set earlier on. Your identification has been saved in /ffp/etc/ssh/ssh_host_key. Your public key has been saved in /ffp/etc/ssh/ssh_host_key.pub. The script will generate some funny looking figures. Then it will start /ffp/sbin/sshd. The SSH daemon is now active and running. Leave the telnet session running. Do not exit yet. Open another PuTTY session and login into the device again, this time using the SSH mode. Click on Yes to continue. Login as: root and put in the password we have set earlier on. 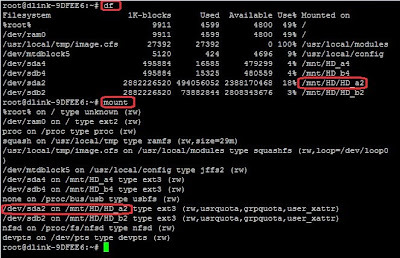 the command: ls will list the files within the folder. Reboot the DNS 320. Launch PuTTY and SSH login with the password we have set earlier. If you are able to login, congrats!! 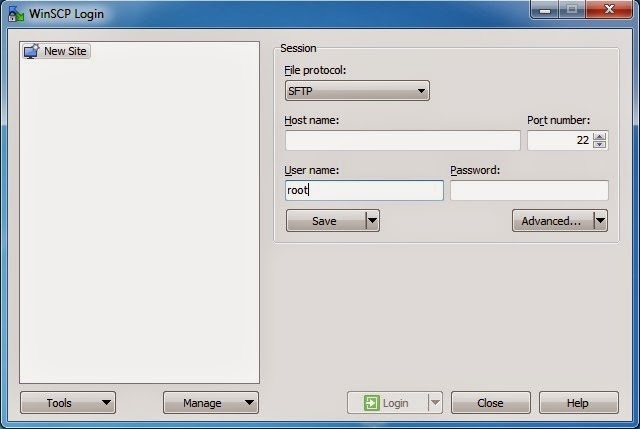 Launch PuTTY and SSH root login with password. Use the arrow-keys on the keyboard to move the highlight. To select, press the spacebar. It is selected when there is a [*] at the beginning at the line. With slacker installed, it is much easier for the next steps. I have existing files. That is why it is showing to reinstall. Press 'Enter' to execute the installation. 8. Location of hard disk drive. Type in the following command to check the actual directory path. Take note of this location address. We would need it later. root@NAS:~# su nobody -c "transmission-daemon -f -g /mnt/HD/HD_a2/.transmission-daemon -w /mnt/HD/HD_a2/Downloads -t -u <Your-Desire-UserID-Here> -v <Your-Desire-Password-Here> -a 127.0.0.1,192.168.*. *"
/mnt/HD/HD_a2/: the location of the primary drive earlier on. <Your-Desire-Password-Here> Your transmission password, without the brackets<>. After you hit ENTER, if you see something as follows, this means Transmission installation is a success. If there is no reaction, stop and go through the steps again. It could be as simple as a spelling error. If all is ok and running, press CTRL+C to stop it. 6. Creating Folders for Transmission Download. Login to DNS 320 via the web interface and create 2 folders. This means that the downloads from Transmission will be directed to the WIP. When it is completed, it will be moved the Download folder. 7. Editing the settings.json file. A lot of the references that I reading up mentioned about using WINSCP application. But none of the resources mentioned about logging in. Until I eventually figure it out myself. So I will tell you the 2 ways that I did. You can choose either one. i. download the json file from the DNS 320 web interface and renamed it as settingsorig.json, for example. The settings.json file is located within the transmission folder. Upload button next to it, which you would need to use it later. Open it on a Notepad and make the following changes. It is underlined as follows. Saved it back as settings.json and upload back into the transmission.daemon folder by using the Upload button mentioned earlier on. ii. The other way is using the WINSCP. password is what we have selected earlier on. You will get something like this. Click on the folder icon on the above screen and the following would appear. folder. Click on upload and it will start the transfer. If there is no error message, congratulations!! Your transmission installation is a success!! Open up WinSCP and go to settings.json file. Launch Transmission and try to download again. The error message was gone. This means that the download goes straight to the Download folder. 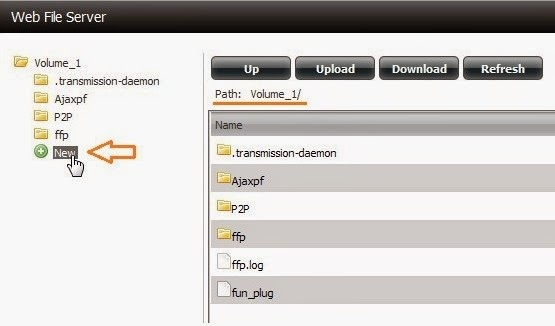 Before using Transmission, I was using a torrent client and it downloads to a folder in my NAS called Peer2Peer. Creating another folder called Download will make things troublesome when I want to locate files. I decided to disregard the Download folder and point the Transmission download to my existing Peer2Peer folder. 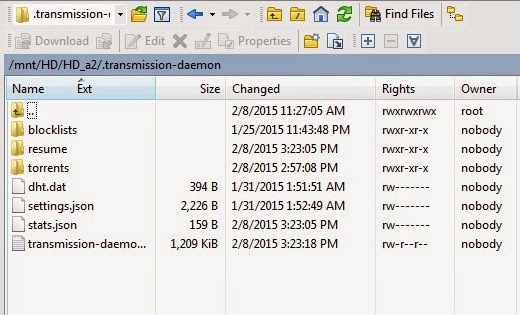 Logging into the WinSCP, open the settings.json file and make the changes. sure that the 'incomplete-dir-enabled': false. With that Transmission worked, pointing to the proper folder. As mentioned earlier on, I have no Linux command experience. I had to rely on a lot of resources. Some of the resources can be confusing and contradictory. That is why I wrote this blog piece. I hope it would be informative for you and an additional resource as well.